In this article ,we describe how to configure different types of activities (time spent records) in your projects and calculate total time spent per each activity type on user stories and bugs level and per projects as well. In Targetprocess it is possible to charge different rates from different clients and projects. The solution allows to set up custom hourly rates per different types of activities that can vary across your projects. 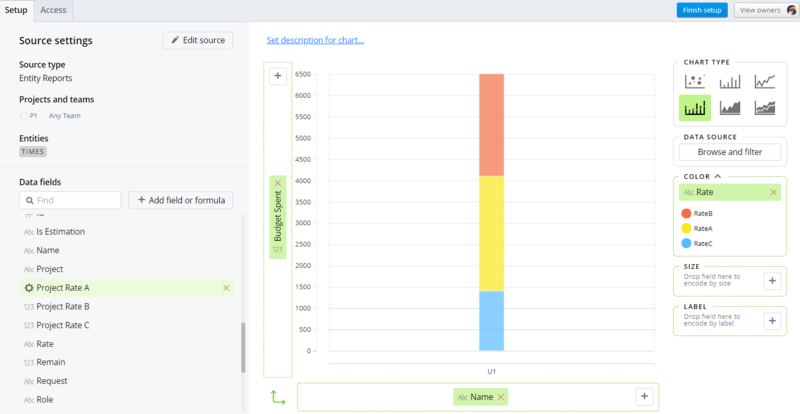 And it calculates total budget spent (cost summary) per user story, bug, project using custom rates by activity type. In a project, we'll introduce 3 types of activity: Rate A, Rate B, Rate C. We'll charge different rates per these activity types. We'll specify selected type of activity in every time spent record. We will use money custom fields for projects to input rates and dropdown custom field to select type of activity for time spent records. 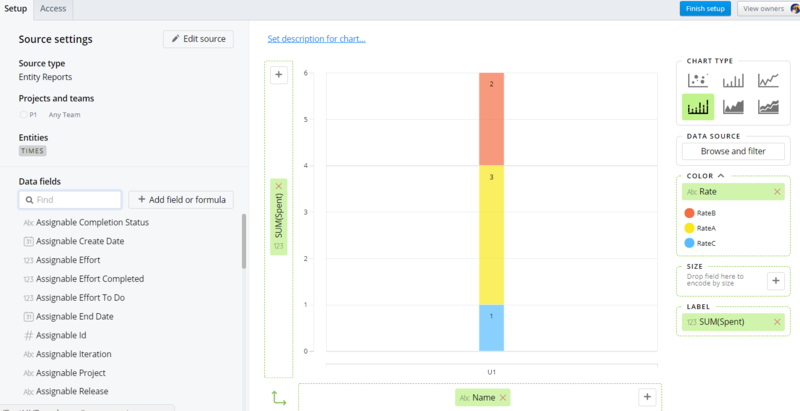 We will build summary calculations using Custom Graphical Reports. Charts with total numbers can be added to your dashboards. Also totals from charts can be exported to CSV files and viewed in form of spreadsheets further. Edit Custom fields settings for the process of your Project. Configure custom fields for Project entity. List view for Project entity with customized columns displays all your projects and their rates in the single place. Create such view manually if you don't have it in your account yet. In this article we will input data into single project only. However, described solution fully supports common setup and reporting for multiple projects at the same time. Edit Custom fields settings for the process of your Project. Configure custom fields for Time entity. Add dropdown custom field for activity type. We'll name it "Rate" and we'll add "RateA", "RateB", "RateC" as three available options. Add user story U1 into project P1. Submit several time spent records to user story U1. Rate field appears in the addition form and prompts for activity type selection for each time record. Hierarchical list view for Worked on > Time entities with customized columns displays all your assignable entities (work items) and their time spent records in the single place. Create such view manually if you don't have it in your account yet. We set up all reports below using Custom Graphical Reports. Totals per Activity types captured from Time spent records. Custom hourly rates by activity type adjusted from Project settings. 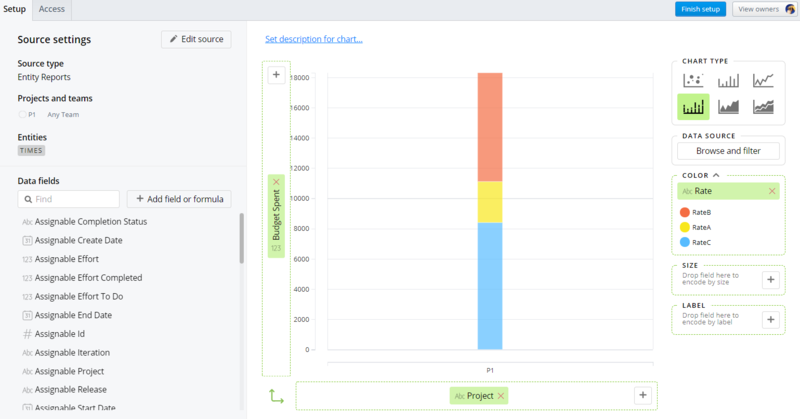 For the calculation on the Y axis you should add 3 new fields under "+Add field or formula"
Similar to the previous report on individual User Story, we can calculate total budget spent on a Project.